Okay, okay - I know it's sad - very sad in fact. 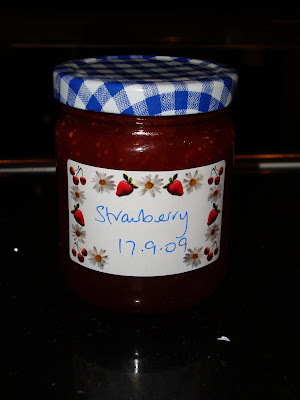 This week I have learned how to make jam. All of the readers who complain that my blog has lost its edge will not be happy about my adventures with pectin, hot glass jars and wooden spoon - but hey ho - this week I have an impending birthday and will be 46 (that's downhill to 50) and so I must take up some pursuits which are suited to a woman of my age. My first batch was strawberry - which was lovely albeit a tad runny - next there was redcurrant and blueberry - no setting problems there!.....then today - after three attempts I finally managed a few jars of plum jam. Technically the plum was difficult - wouldn't set you see - Posselq had to bob down to Tesco to get me a bottle of pectin - and even then I had to add more lemon juice....this jam making is very technical y'know!!! Finally the plum jam set and after just trying some on a scone with a big blob of clotted cream I have to say that it's delicious!